In this book, Khwaja Kamal-ud-Din clarifies the most misunderstood topic of the teachings of Islam — Jihad (The Holy War). To ensure peace we have often to disturb peace, and then the martial spirit that has been implanted in us by God for our safety comes into play. The protection of life and property is a common instinct, but it has often served as a pretext for oppression and tyranny. We are not free from inordinacy, and if we need something to put us on the right path, war is indispensable in order to restrain those who would otherwise be beyond our control. In other words, we need ethics of war, as war is one of the essentials of our civilisation, and a Warrior-Prophet was needed to act as an exemplar in this respect. We fail to find any healthy principle of war in the Bible. The Israelite fighting aimed at the extinction of enemies, and sowed vengeance and rancour in human hearts. Since the Prince of Peace did not come for peace but for fire and sword, as he said himself, he asked his disciples to sell even their clothes in order to purchase weapons of war. His mind seems to have been agog with various other high-flown but contradictory ideas, but he could neither digest them nor reconcile them to each other. He left his followers, as it were, in a maze as regards military matters, and they began to walk knee-deep in human blood after him. They still do the same, though in a more refined manner, when any occasion arises. Man, however, felt the need of some guidance here. The Hague Conference was constituted for this very object, but it failed miserably in its aims. The League of Nations has now begun to move in the same groove, but the intention of its framers is not above suspicion. It is alleged that the institution has been formed to crush down the aspirations of the East towards self-determination.1 Europe already possesses enough of arms and ammunition to keep others under her subjection, and the proposal of disarmament in the League is simply to disable the East from recouping their shattered military Materiel. These institutions are, after all, human institutions. No man can be bound by another’s injunction if it is at all likely to go against his interest. But if he finds himself so bound he tries to find means to get rid of the obligation. Treaties in Europe are meant for the waste-paper basket. They are honoured more in the breach than in the observance. We need a word from God Himself on this subject which may act as an article of our faith. This is not a mere theory. The history of warring peoples has proved it. Those who were once an embodiment of oppression and a curse to humanity on account of their prowess became as gentle as lambs under the salubrious influence of Divine Revelation, and won the title of the “Gentleman Soldier” from the world. They were once reckless in the matter of life, and wielded their swords ruthlessly; but these unscrupulous people became clean fighters under the teachings of God. The country surrounding the Caspian Sea has produced fighting people from the very beginning. They were a nomad race in olden days, and filled others with terror. They were the Gog and Magog of the ancient days, and Darius of Persia had to build a wall between the Caucasian Mountains as a protection against their incursions. Later on, they appeared under the name of Scythians. Even India did not remain safe from their inroads at that time. They overran Europe under another name; in the days before Jesus they appeared in Europe as a formidable people in the shape of the Huns and Goths. Their ferociousness can be traced in their present descendants. India saw members of the same stock in Aryan invasions. They drove the ancient people of India to their mountain fastnesses. They would not leave even a breathing-space to their enemies. We often hear nowadays the Hindus in India boasting of Aryan civilisation, but if it inspired its people with the worst kind of hatred against the Untouchables — the residue of the Indian aborigines — it could not claim even a semblance of refinement and good manners. The Untouchables, even today, are not allowed, in India, many of the rights of humanity; their shadow was once shunned, and even now they are kept at a distance from others; and this is only a vestige of the tyranny that the ancient Aryans used to exercise towards those who were only guilty of owning India as their motherland. The units of the same stock — the people living around the Caspian Sea — were the Tartars of Central Asia in pre-Islamic days. They overran the whole country and reduced it to ashes. They brought destruction and devastation wherever they went. The sound of their drum was a death-knell to those who feared their depredations. They adopted Buddhism for their faith, but the names of Halakoo and Changez still cause terror among the Caspian races. Afterwards they came under the influence of various religions. As the Tartars were Buddhists, the Aryans followed the Vedic persuasion while the Huns and Goths became Christians, but no religious dispensation mitigated their ferocity or reformed their bloodthirsty nature. Thus, the question of war has always remained a most difficult and intricate problem. War could neither be dispensed with, in the interest of peace, nor could it be pursued on the lines laid down in bygone days. The world had urgent need of a true reform in this respect, and it has come in the form of Islam. Without making any introductory remarks, I approach the subject directly and give the essentials of Islamic teachings in this matter. 1. To restrain disturbances and keep every land free from others’ incursions. 2. To defend life and property from others’ hands. 3. To enable every person to follow his religious convictions, whatever persuasion he may belong to. 1. “… If you will not do it [fight], there will be in the land persecution and great mischief” (8:73). 2. “Permission (to fight) is given to those upon whom war is made because they are oppressed, and most surely Allah is well able to assist them”; “Those who have been expelled from their homes without a just cause ….” (22:39, 40). The third object of war is, however, a vexed question. It has furnished enemies of Islam with a pretext for carping against the faith, though the Holy Quran has given the most desirable and humane teachings on the subject. “… And had there not been Allah’s repelling some people by others, certainly there would have been pulled down cloisters and churches and synagogues and mosques in which God’s name is much remembered; and surely Allah will help him who helps His cause ….” (22:40). In this verse the Quran identifies the maintenance of religious houses of every faith with the Cause of God. It is to be noted that Muslims are ordered to sacrifice their lives not only to save their own mosques but the religious houses of other peoples as well. The civilised world, with Christian notions of intolerance lurking in its breast, is still far from holding the noble principle thus enunciated in the Holy Quran. And there is yet another lesson in Islam to be learned by Christian rulers of other nations. A Muslim king is enjoined by his religion to help in the maintenance of others’ temples and shrines. This was done by the Emperor Aurangzeb, in Benares. It is not a solitary and unique example in the history of Islam, but I have advisedly chosen the above two names (a ruler and a town) for certain reasons. Modern historians of India — whether European or Indian — under Western influence have, for political reasons, concocted lie after lie to discredit Muslim rule in the eyes of the Hindus, and the said Moghul Emperor has been chosen as a fit subject for all their carpings, who, they say, demolished most of the Hindu temples and abolished their rites in Benares, one of the chief centres of the Hindu religion. The real case is just the reverse. The Emperor gave big estates and endowments for the maintenance of Hindu temples in Benares. Fortunately for us, the custodians of these temples hold “firmans” (orders) of Aurangzeb entitling them to such estates, otherwise they would have been confiscated by the British rule. I have photographs of those “firmans” with me. Kashmir, at present a Hindu State, maintains a large number of Hindu temples out of the estate created by the Moghul Kings for them, and most of the endowments came from Aurangzeb. Even today I find the same Muslim liberality in Hyderabad (Deccan) and in the State of Bhopal, where a large portion of the State revenue goes to maintain non-Muslim shrines, including Christian and Zoroastrian churches. Even in time of war a Muslim soldier is forbidden to touch an alien’s house of worship. He has to spare the lives of religious teachers.2 It is a pity, therefore, to find that the civilised nations of today, when engaged in the Great War, could not observe the above rules. Churches were demolished, mostly in France and Belgium, and priests were murdered in the war. Muhammad, as I have said before, appeared as a Warrior-Prophet, not only to protect his own faith and the lives of his followers from the ruthless tyranny of his adversaries, but to lay down rules of guidance for the coming world in the matter of war. The story of the Great War is palpable proof that man-made rules are either insufficient to meet the situation or can be set at naught by those whose interests are opposed to them. Muhammad had to fight several campaigns and thus left tracks on the pages of history for our guidance. He always respected treaties made with his enemies. I will now attempt briefly to describe the events of his life in this connection, and give the beautiful Quranic injunctions to which they gave rise. “Permission (to fight) is given to those upon whom war is made because they are oppressed, and most surely Allah is well able to assist them”; “Those who have been expelled from their homes without a just cause except that they say: Our Lord is Allah …” (22:39, 40). “And prepare against them what force you can and horses tied at the frontier, to frighten thereby the enemy of Allah and your enemy and others beside them, whom you do not know (but) Allah knows them; and whatever thing you will spend in Allah’s way, it will be paid back to you fully and you shall not be dealt with unjustly” (8:60). “Say to those who disbelieve, if they desist, that which is past shall be forgiven to them; and if they return, then what has happened to the ancients has already passed. “And fight with them until there is no more persecution, and religion should be only for Allah; but if they desist, then surely Allah sees what they do. “And if they turn back, then know that Allah is your Patron; most excellent is the Patron and most excellent the Helper” (8:38-40). “If you demanded a judgement, the judgement has then indeed come to you; and if you desist, it will be better for you; and if you turn back (to fight) we (too) shall turn back, and your forces shall avail you nothing, though they may be many, and (know) that Allah is with the believers” (8:19). “And if they incline to peace, then incline to it and trust in Allah”… “And if they intend to deceive you — then surely Allah is sufficient for you …” (8:61, 62). Many of the tribes now entered into treaties of defence with the Prophet. The main object of most of them was to deceive the Muslims, as the Quran says, “Those with whom you make an agreement, then they break their agreement every time and they do not guard (against punishment)” (8:56). “(This is a declaration of) immunity by Allah and His Apostle towards those of the idolaters with whom you made an agreement. “So go about in the land for four months and know that you cannot weaken Allah and that Allah will bring disgrace to the unbelievers. “Except those of the idolaters with whom you made an agreement, then they have not failed you in anything and have not backed up anyone against you, so fulfil their agreement to the end of the term; surely Allah loves those who are careful (of their duty). “So when the sacred months have passed away, then slay the idolaters wherever you find them, and take them captives and besiege them and lie in wait for them in every ambush, then if they repent and keep up prayer and pay the poor-rate, leave their way free to them; surely Allah is Forgiving, Merciful. “And if one of the idolaters seeks protection from you, grant him protection till he hears the word of Allah, then make him attain his place of safety; this is because they are a people who do not know” (9:1-6). The fourth verse of the above quotation clears the whole situation and comes as a saving clause in favour of those who kept the treaties. The punishment mentioned in verse 5 of the above quotation refers only to those who could not come under the above saving clause. The hostilities were resumed against the breakers of the treaties who continued to persecute the Muslims. But though the former had no right to be saved, having forfeited their lives and liberty, yet they were given a chance of life in verse 6. The commandment is not general and should act as a rule of guidance in interpreting all the injunctions relating to Muslim fighting. In the above quotations I have also given all the verses from the Quran which have from time to time furnished a weapon against Islam to adverse camps. A critic ought to be just and fair in his comments. I wonder how it fits the mouth of a learned and honest Christian missionary (most of the adverse critics of Islam being found among that class) to select some stray verse from the Quran to suit his evil intentions, and ignore the verses that precede or succeed his favourite quotation. 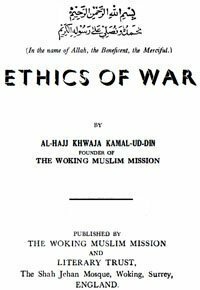 In short, the world has always needed good ethics of war, and Islam came to meet the demand. It prohibited all such fightings as were waged for the sake of gaining possession of the land and property of others, or was entered into the name of religion. Islam came to maintain the peace of the world, as its very name shows, and permitted the unsheathing of the sword in defence of life and property and religion, where they were disturbed without any just cause.